Trench and Gingham are a great association for Spring! This year, I invested in a long cotton trench coat from Mo&Co. Indeed, I love the shape of a classic trench coat for women but I wanted a versatile trench to also wear it like a vintage dress. Moreover, I really loved the details of the trench with the long buckle-fastened belts and cuffs which give a boyish look to the trench. 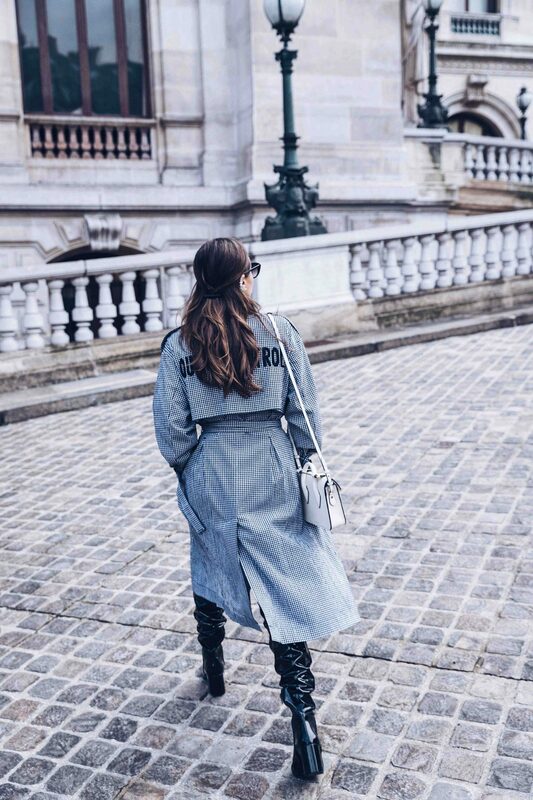 In addition, the back of this trench is far from being classic! Embroidered on the storm flap are the words ‘Out Of Control’. Embroidery is a strong trend in 2018 and “Out Of Control” is a cool twist on this wardrobe staple. Furthermore, I love the buttoned epaulettes which structure the silhouette. What trench for Spring 2018. 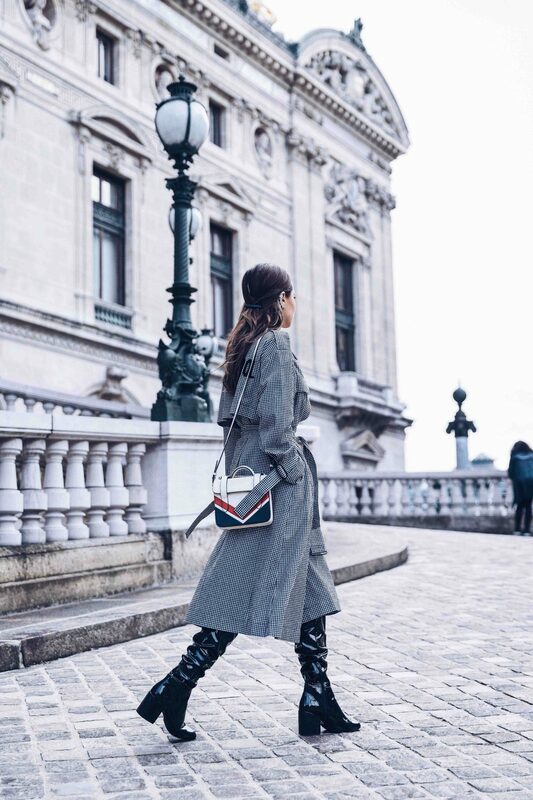 For this season, I opted for a long trench which can be also worn as a dress. For the length, I would wear it knees-high or after the knees. Moreover, for a long and lean silhouette, I prefer to wear a light fabric like cotton. However, vinyl/plastic trend is very strong this season, so you can also choose a vinyl trench to modernize this basic. How to wear the long trench coat? 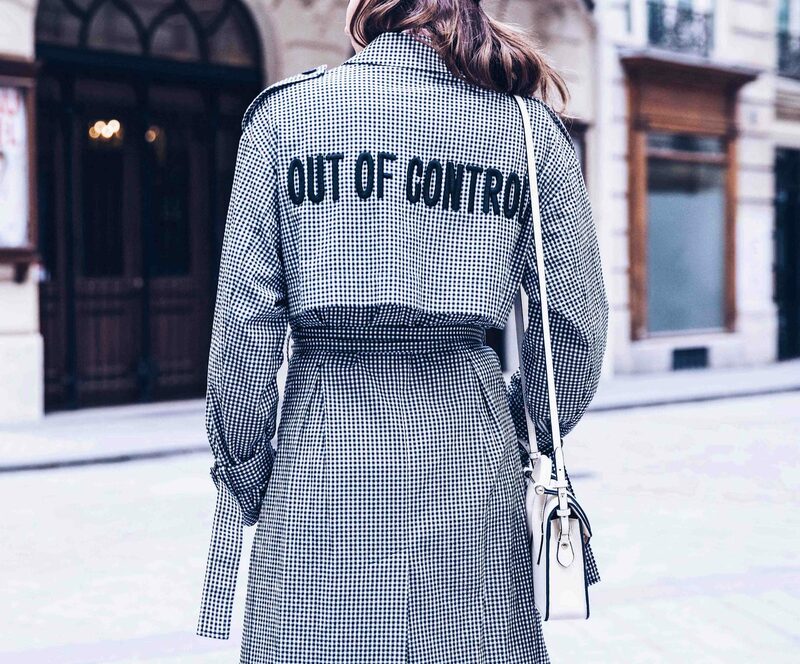 You can wear this trench coat as a trench or as a dress. The fabric is of cotton and very comfortable. To transition from winter to spring, I wear this trench as a coat with over the knee boots and a legging. But I see myself wearing it as a dress, or with jeans and white sneakers, or with shorts & a silk camisole. Gingham and trench are timeless. Therefore, I will be able to wear this combination for years. You can find below a selection of my favorite spring trench coats. 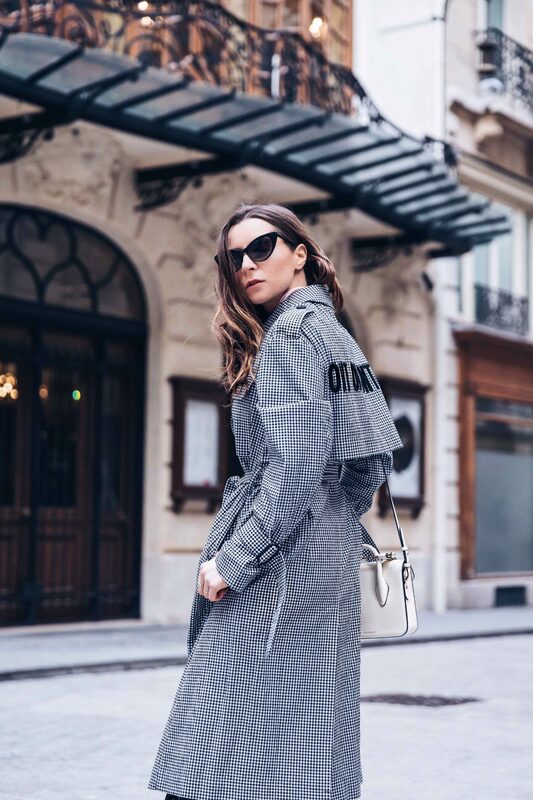 Credits: Julia Comil is wearing a gingham trench coat from Mo&Co size XS, Pink Top by Edition 10, vinyl over the knee boots from Aldo, sunglasses ZeroUV and the MC Nano Chevron Strathberry bag. Photographer: Sebastian Erras. Pictures took in Paris at Palais Garnier and nearby. March 2018. This is SUCH a classy trench coat! I so love the trench coat. I also love the place. the photos you post are all beautiful. Thanks for sharing this to us. This is such a cool gingham trench coat babe!! I love the length and you are totally rockin it! This coat is very fabulous on you! I think it’s really cool that it can be worn as either a coat or a dress. That trench is EVERYTHING! Such a statement piece! I need those boots! Also this trench coat is bomb!! Thanks!!! These boots are such a gem!! These photos are absolutely gorgeous!! I love how chic that trench is too! That gingham trench is to die for! So pretty on you babe! this trench is SO cute!! it’s the right amount of sassy! This gingham trench is so gorgeous! I love that it is a bit edgier with that saying on the back! How perfect! I always love trench coats for spring! 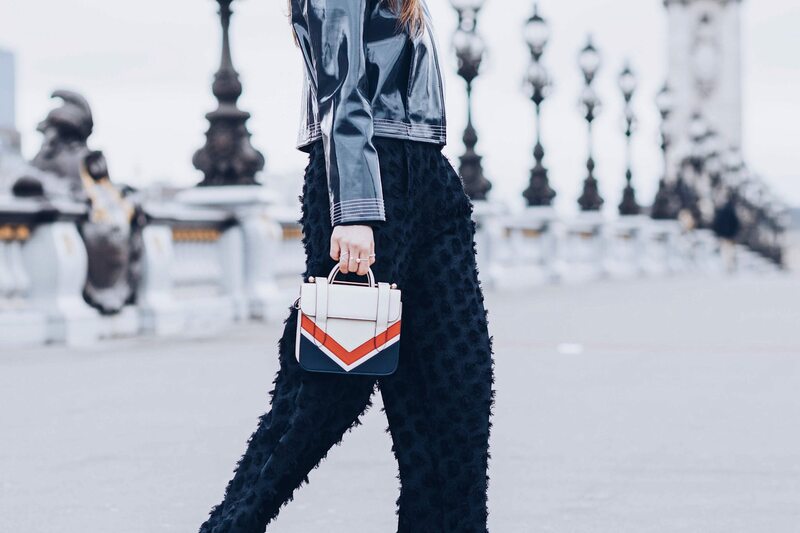 There are shown my favorite street style looks and what designs to try this 2018.